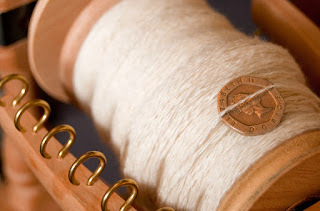 Stitchin' Bints: 1200 yards spun and plied! 1200 yards spun and plied! Wouldn't it be great to have an odometer fitted to your wheel to keep count of the miles treadled? Mine has worked very hard over the last few weeks making 2400 yards of singles. 2-plied it measures in at around 30 WPI. It looks silky (it's 80% merino, 20% silk) very thin and nice and consistent. I'm very very pleased! 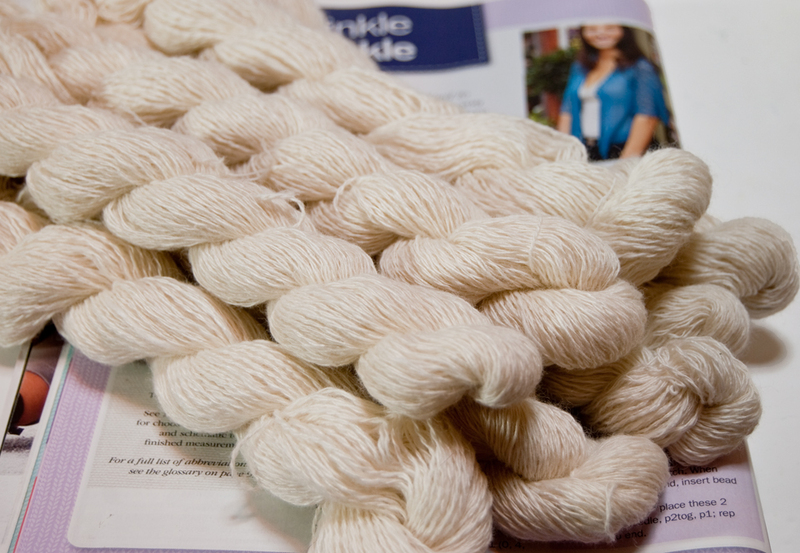 After plying the first two bobbins of singles, making skeins and doing some maths I found that I had about 880 yards (from 130g). It's difficult to know for sure how much is needed for the pattern but I've plumped for 1200 yards and so I settled down to spin half as much again. Which I've just finished. This is my 1200 yards of merino/silk, the finest I've made and the most I've spun in one go too. These are small skeins (100 turns each = 166 yards) Next step is the dye bath and I want to make sure that the dye can get to all of the yarn. he hee! I hate to think how many hours I've put in to finish this. That's a whole lotta spinning and one good thing is I noticed that I was working more and more quickly. That last 300-odd yards took a few hours yesterday and a few more today. You mentioned you might be knitting the same pattern from bought yarn - will we be knitting along together? 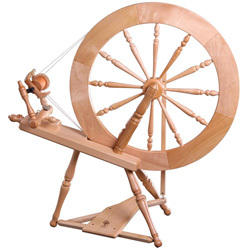 spinning fine yarn - when to stop? !